Yes, you can find convenient fast-cook meals, but you'll have to do your homework. Ever notice how nutrition takes a back seat when you're hungry? Packaged and prepared foods somehow don't seem unhealthy when you need a meal in a hurry. But is there such a thing as a nutritious convenience food? "Yes, there are some healthy options out there, but you really have to look for them," says registered dietitian Kathy McManus, director of the Department of Nutrition at Harvard-affiliated Brigham and Women's Hospital. Packaged, prepared foods come in several forms: boxed, dry goods such as quick-cook pasta and rice mixes; canned foods, such as soup or ravioli; or frozen foods, such as a single frozen dinner or a "family-sized" lasagna. All of these are usually loaded with calories, salt, saturated and trans fats, sugar, refined carbohydrates, additives, and preservatives. "It's not the worst thing if you eat this kind of fast food once in a great while, but if you start eating a lot of it, it can lead to weight gain and the health risks that come with it, such as high cholesterol, high blood pressure, diabetes, and heart disease," says McManus. And don't think that take-out food is the answer, either. "Food 'to go' has the same problem. It's quick and it's hot, but it's probably salty, fatty, and very high in calories," says McManus. Some convenience foods do come in healthier versions. It takes a bit of detective work to find them, however. Start with ingredient lists. "The fewer ingredients, the better, and make sure that real foods are on the list, whether it's meat or vegetables," says McManus. If there's any added sugar, it should be one of the last ingredients, since ingredients are listed in order of quantity. Look for dry foods, such as whole-grain cereals (shredded wheat or rolled oats); frozen or canned vegetables (without added salt); canned tuna or salmon; some frozen fish or shrimp; and some frozen entrees, usually from companies that promote the fact that they use organic ingredients. It won't take long to microwave a fish fillet and open a can of green beans, or heat up a nutritious frozen dinner. Even better, start thinking in terms of fresh foods you can prepare in the same amount of time, or frozen meals you've made yourself that can be reheated when you're on the go (see "Make your own 'fast food'"). An easy way to get a healthy meal in a hurry is to plan for hectic meal times. "You know there are going to be times when you'll want to take something out of the freezer and have it ready in five or 10 minutes," says registered dietitian Kathy McManus, director of the Department of Nutrition at Harvard-affiliated Brigham and Women's Hospital. She recommends batch cooking—making a meal in a large quantity that you can freeze in small portions. 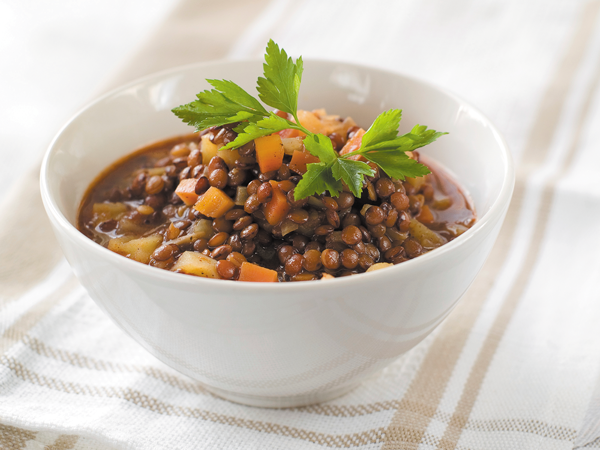 "This works well with vegetarian or turkey chili, and lentil or bean soup with plenty of vegetables. A marinara sauce is a simple thing you can create in a batch, and then add some turkey meatballs that you've made in advance to whole-wheat pasta," says McManus. She also suggests using a crock pot to create stews that cook all day and are ready when you get home. But really, any meal that freezes well will work for this concept. McManus also suggests having healthy snacks on hand. "Keep a list of grab-and-go foods that you replenish each week," says McManus. 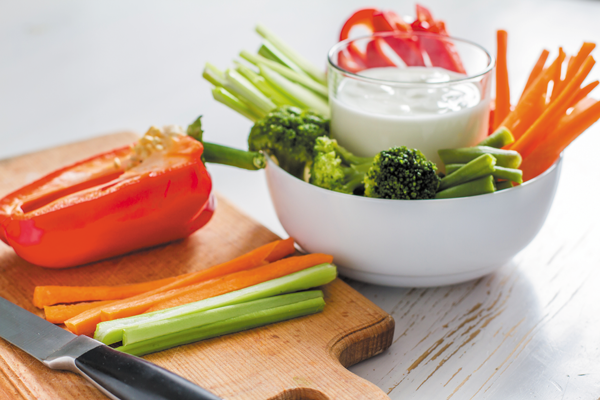 Ideas include low-fat, no-added-sugar yogurt; whole fruit; hummus; and snack packages that you assemble each week, filled with nuts, whole-wheat crackers, or chopped vegetables. "Having these foods on hand is the main thing," says McManus. "It just takes a little planning. But in the long run, it's healthier, and it's cheaper, too."